Also known as plains zebras, Burchell’s zebras are the most abundant of the three zebra species and live in the savannahs of Eastern Africa. They usually travel in herds, but disperse during the day to graze alone on coarse grasses, gathering later to find water. 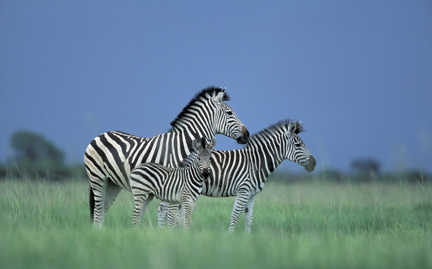 No two zebras look exactly alike, as stripes vary between individuals. Living in permanent small family groups, Burchell’s zebras commonly mix herds with antelope, adding extra protection against predators. These equines are threatened by habitat loss.